The Empty Pocketbook: The Plaid Barn Giveaway! Hello readers, it is nice to be writing again; a lot has happened in the past few months, but I'd like to begin with this amazing giveaway from The Plaid Barn! First thing first - are you crafty? Do you like cheap things? Do you like cheap, crafty items? If you said yes to either, or especially both of these, you'll love this site. Every weekday The Plaid Barn features one flash sale of a particular item, when the sale ends, it's gone (unless they offer goodie boxes!). Items on this site go fast, as everyone wants to get their crafty hands on a roll of washi tape for only $1.50 or less! When I say "on sale" I mean it! Items for sale can range from jewelery kits, tape, string, tags, wood crafts just to name a few. 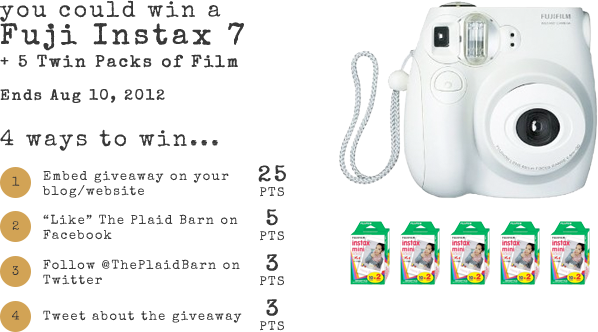 For the next two weeks, The Plaid Barn will be offering a chance to win a Fuji Instax 7 with 5 packs of film! (WOW!) Follow the instructions to enter and receive points! Good luck! Follow my Instagram via Instagrid!